In 1933, two motorcycle enthusiasts named William Lyons and William Walmsley took their Swallow Sidecar Company and formed SS Cars Ltd., producing their first car, the SS Jaguar, in 1935. Following World War II, SS Cars formally changed its name to Jaguar and began producing sports cars such as the XK120, XK140, and the E-Type. With a sales slogan of “Grace, Space, Pace”, Jaguar has always been committed to producing luxury vehicles and sports cars. 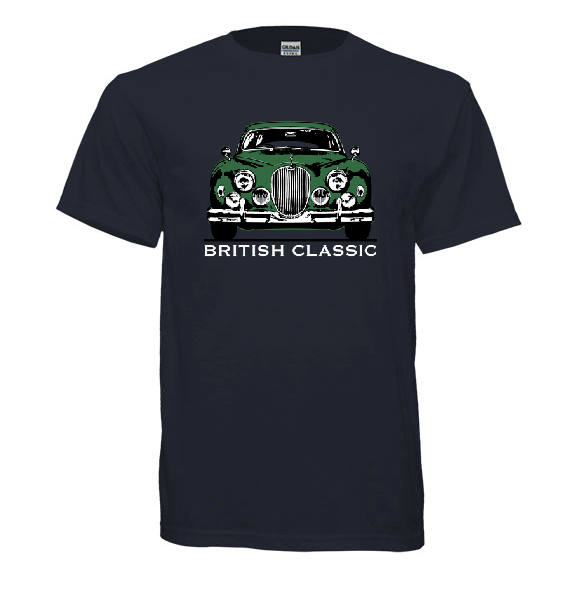 With the firm celebrating its 70th Anniversary this year, it is our hope that you will enjoy this great t-shirt recognising the accomplishments of one of Britain’s automotive giants as well as these interesting facts. 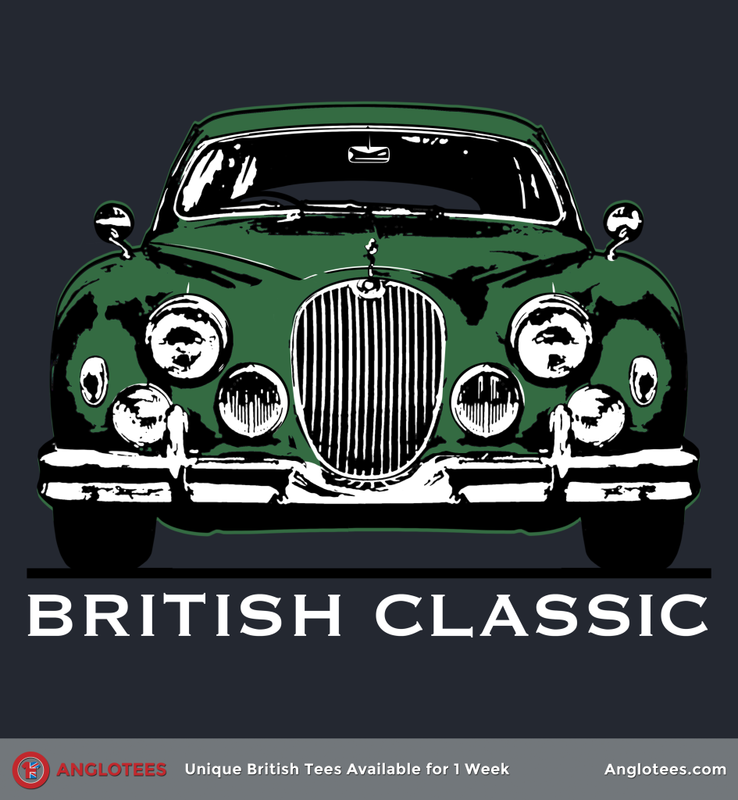 There’s 72 hours left to get our latest British Classic car themed design dedicated to the Jaguar Mark 1. Available in men’s, women’s, v-neck, long sleeve, hoodie and sweatshirt starting at $16.99 and shipping worldwide. As mentioned above, Jaguar actually started out as the Swallow Sidecar Company in 1922, making sidecars to go with motorcycles. Lyons and Walmsley started the company with a £1,000 loan taken out with the help of their fathers. In 1927, they began experimenting with cars by coachbuilding kits for the Austin 7. That same year, they stopped making sidecars and changed the company name to Swallow Coachbuilding Company. It would only be eight more years before they started making their own automobiles. For decades, Jaguar’s hood ornaments, also known as “The Leaper” featured a prominent leaping jaguar. In 2005, Jaguar removed the Leaper from its models in line with the European Union’s safety standards for automakers. In addition to removing the Leaper out of safety concerns for frontal collisions, vice president of marketing and communications Tim Watson said “We’ve taken a much more modern, svelte, and aerodynamic approach.” Customers can still have the Leaper added to their cars for about $250. 24 Hours of Le Mans is the world’s oldest sports car endurance race in which teams of drivers take turns to keep the race going for a full day. 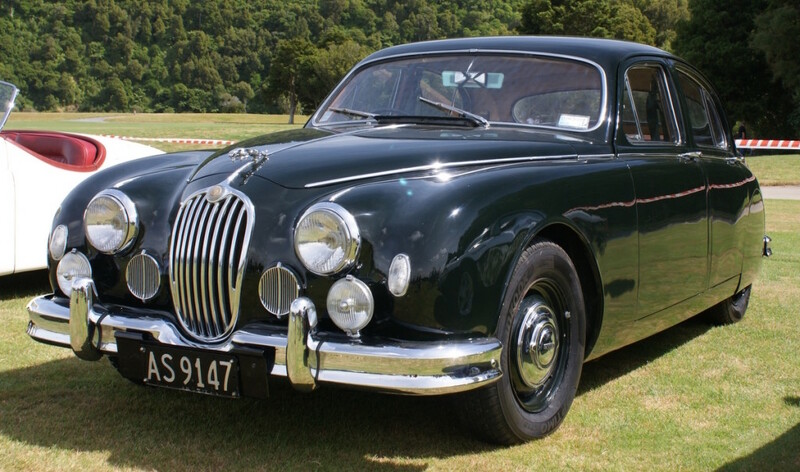 Jaguar first won in 1951 with a XK120C and has won the race seven times, the last race being in 1990 with a XJR-12. Jaguar climate tests all its vehicles in a freezer at -40 degree Fahrenheit for 12 hours. Then they stick the cars into a wind tunnel with air streams that are 0 degrees all while spraying the car with water. This is to ensure that, no matter how cold it gets outside, your Jaguar will run like a dream. For the company’s XJ models, Jaguar uses only leather from Scottish Angus Bulls. The reason for bulls over cows is that the cows can get stretch marks from pregnancy. What’s more, the Scottish bulls are less likely to have been bitten by mosquitos, which could damage the leather. Skin from the belly and neck are used for the dash and the doors, while the rump and backbone are used for the seats as those parts of the hide are tougher. Jaguar relied on the American cinematic tradition of British actors playing villains for its 2014 Super Bowl commercial that featured Ben Kingsley, Mark Strong, and Tom Hiddleston. During the filming, Hiddleston had to hang out of the side of a helicopter that was approximately 500 feet off the ground moving through central London, an act that actually terrified him (though he doesn’t let it show). In the same commercial, the driving was actually done by former Top Gear Stig, Ben Collins. Jaguar’s designers have a Virtual Reality Cave with eight cinema-quality 4K projects that help to recreate the interior of the cars so that designers can sit in their designs and get a sense of proportion. It also lets them form 3D models of parts to see how they will work together. Steve McQueen was once the proud owner of a Jaguar XKSS, which was one of only 16 ever made. The car got him in a bit of trouble, though, and he had two driving bans over the ten years that he owned it. He eventually sold it, but regretted the decision and later bought it back, keeping it until he died in 1980. Prior to painting, Jaguar workers brush every car with ionized emu feathers because they can briefly hold an electrostatic charge. This way, the bare metal won’t attract dust between the final cleaning and the painting. Next post: The Brit Food Fiver – Five Unique British Foods You Have to Try – Which is your Favorite?